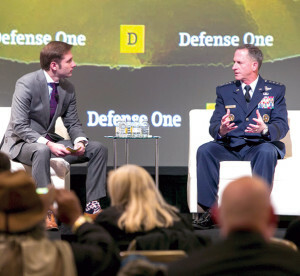 Defense One’s Marcus Weisgerber, left, speaks with Air Force Chief of Staff Gen. David L. Goldfein about multidomain warfare at the Defense One Summit in Washington D.C., Nov. 17. WASHINGTON — New technologies, new tactics, new threats, limited budgets — all these have combined to change the face of warfare in the 21st century, and Air Force Chief of Staff Gen. David L. Goldfein is among the leaders sorting out just what that will mean. Goldfein spoke with Defense One’s Marcus Weisgerber in Washington, D.C., Nov. 17 and gave the reasoning behind the changes being contemplated for the future of defense. In addition to being responsible for the “man, train and equip” mission for the Air Force, the chief of staff is also a member of the Joint Chiefs of Staff. The U.S. military is the most joint force on earth, he said, a fact that has been proven over the past 15 years of warfare. “We actually have trust and confidence that is built to the level that has set the table for us to do some really evolutionary work in the future,” the general said. The military is now in the age of information warfare, Goldfein said, and the question now is what does the future look like? It also will entail creating effects across all domains to create operational agility, which, he said, when combined with decision speed, creates a deterrent that no one can counter. The United States probably makes decisions faster than any other country, but it will not be fast enough for the future, Goldfein said. The future must be a common operating system, the general said. The proprietary systems that exist now are separate and require another system to amalgamate the information and assess it. The current system does not give leaders the situational awareness they need fast enough. Some of this will be dependent on new technologies or advances in current technologies. Intelligence analysis today is too dependent on “industrial age” procedures, in which humans do much of the assessments that could be done faster and more accurately by computers. 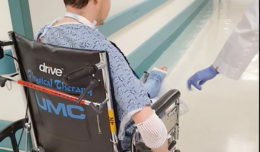 “We got to get into the next stage, which is machine-to-machine, human/machine teaming, and artificial intelligence — to turn all that data into decision-quality information and then you act,” he said. The Air Force is already experimenting with the process, Goldfein said. Called Data to Decision, the experiment takes information from all domains and places it into one common operating system, he said. This could help the Air Force in many ways, the general said. Americans see the results of airstrikes on the Islamic State of Iraq and the Levant in Mosul almost every night, he said, as they see footage of bombs or missiles going exactly where intended. “Sometimes we tend to focus on the end game, which is a bomb that goes into its intended location,” Goldfein said. People need to understand what happens before the boom, and that includes collecting the pattern of life at a target location, collecting intelligence, ensuring it is a valid and lawful target, confirming the position of any friendly forces and limiting the exposure of any innocent civilians, the general said.